Hot News, Dark Spells, and on Fire! News first! No time to explain, let me sum up. The Insecure Writer’s Support Group’s next post is THIS Wednesday!!! Jen Daiker will be published in a collection of romantic stories next year – way to go, Jen! I won Laura B. Writer’s 200 followers contest – an eBook copy of Kristen Lamb's Are You There Blog? It's Me, Author! Thank you, Laura. Saw Puss in Boots – great animation and solid story. Think adventure rather than comedy. And not for real little kids, as they simply won’t follow the storyline. Madeleine Scribble and Edit gave me the Friendly blogger award. Thank you, Madeleine! Darkspell by Elizabeth Mueller – available today! As seer of Stormhold Coven, Alex is sworn to be Winter’s protector against the darkness that hunts her. Violently thrust into a magical realm she always thought impossible, she stumbles upon a disturbing secret of her own. Will love prove thicker than magic? Spookfesta question - "If I had all the magic in the world, I'd . 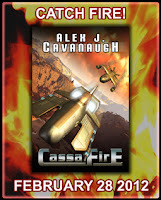 . ."
Thanks to everyone who has signed up for CassaFire’s Catch Fire! blog party on February 28, 2012! 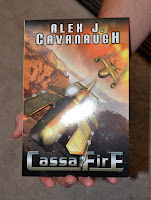 If you haven’t, visit HERE (see also tabbed page under my header) to join the fun and a chance to win a copy of CassaFire. And thanks to those who’ve spread the word about this blog party. My official tour is now set and CassaFire is already on Goodreads with a four star review. Happy Halloween! Anyone else have a wild week or weekend? Participating in Elizabeth’s fest? See a movie? About to panic because NaNo starts soon…? November Movies and Movie Awards! Big announcement this week – the 411 Movie Awards are back! These were a lot of fun last year and I had the honor of winning the Best Science Fiction Blog. I encourage everyone to visit their SITE and nominate YOUR favorite movie-related blog. Now on to the November movies. As always, descriptions courtesy of the IMDB. Snarky comments by me. With the help of three fans, The Muppets must reunite to save their old theater from a greedy oil tycoon. On Christmas night at the North Pole, Santa's youngest son looks to use his father's high-tech operation for an urgent mission. Yes, three kid’s movies on the same day! Wonder who will win…? Tucker & Dale vs. Evil on DVD! Don’t forget to nominate your favorite movie blog! Which movies catch your eye this month? And does anyone know more about that Harry Potter film…? And I have to mention this - I never look, but I checked my Amazon Kindle ranking last night and CassaStar was number eight in science fiction-space opera! I was in the Amazon Top Ten!!!!! Wow, I need to post news updates more often! You guys really rocked the house on Monday. I’m hoping you do the same today, because I have a most awesome guest. Many of you have joined the Insecure Writer’s Support Group. (Don’t forget we post next Wednesday!) And behind every great endeavor is the spark of an idea. My guest today sparked the idea for the Insecure Writer’s Support Group. During an email exchange with this author, I stated that if there were such a group, he’d be an honorary member. My guest today is Rusty Webb, an amazing critique partner, damned good writer, and really excellent friend. Hi everyone. Alex has once again been kind enough to allow me to post something for you. He suggested that I talk about writers being neurotic. Well, sounds good to me, I figured it might be necessary to determine my current state of mental well-being. It might be better if I asked my wife. I walked into the bedroom where my wife was seated on the bed and moving all her things from one purse over to another. She does that a lot. I watched her for a moment before it became clear she wasn't going to stop what she was doing just because I was standing there. "Hey sweetie?" I asked. Silence. Not a good sign. I counted to five and spoke again. She shifted a bit and stared at her new purse. "No," she said. "You are not neurotic... but you do have issues." "Oh," I said. "Issues, eh? Do you still love me?" "Okay then, this interview is over." And there you have it. My wife's assessment. I was out of the room and back on my laptop before she could say anything else. She was probably done anyway. So, with my sanity assured, what does that mean about the larger issue of writers and their issues? Well, I’ll say this. When you write, the closest thing I can compare it to is being a contestant in beauty pageant. You know, you think you look good, your friends say you look good. But until you’re standing there, dressed in your bathing suit in front of the whole world, being judged, you just don’t know. I think it’s that not knowing that can make otherwise normal people get weird. You write, and then you hope your friends aren’t a bunch of liars. It’s the not knowing that drives you crazy. 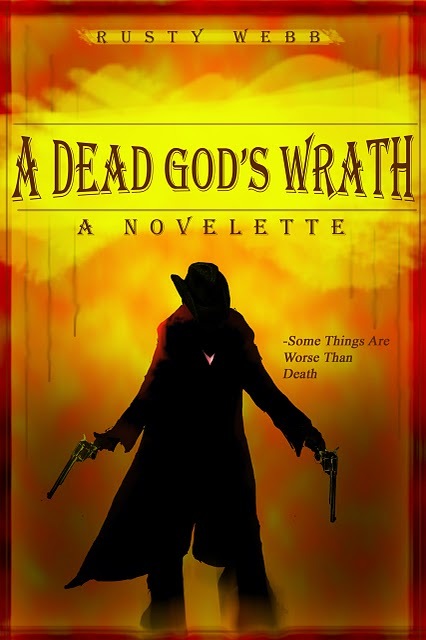 I’ve had the privilege of reading Rusty’s unpublished novel, as well as his novella, Dead God’s Wrath. Dude, it’s time you knew the truth – you are an incredible writer. Arlee Bird is preparing for next year’s A to Z Challenge and set up a blog for participants. If you intend to participate again next April, hop over to The A to Z Challenge and follow to receive all the latest updates. Dave at Dave Wrote This is hosting The Noughties Blogfest on November 14. “List something from each year (2000-2009) that you loved.” Short and easy! yes, I’ve signed up for this one. My extremely talented critique partner, Anne Gallagher, set up an author web page for her Regency romance books. The Lady’s Fate is her latest. I was given the honor of reading an excerpt from this book, and it was excellent. Yes, that’s right – this tough Ninja Captain read part of a Regency romance novel! Susan Kaye Quinn’s new book, Open Minds (Book One of the Mindjack Trilogy), comes out on November 1, 2011. Laura at the Daily Dodo is giving a away a signed copy of 21st Century Dodos – but you must answer a question first. The Internet Book Fair is October 25 and Jessica Bell is on a mission to sell your books! My buddy TS recently started a new job selling cabinets. He’s never been in sales before, so if you are in the market for cabinets, support a fellow blogger and visit The Non Review first. Wednesday I’ll have a special guest here to entertain you. He’s pure genius when it comes to writing and storytelling, so you don’t want to miss it! 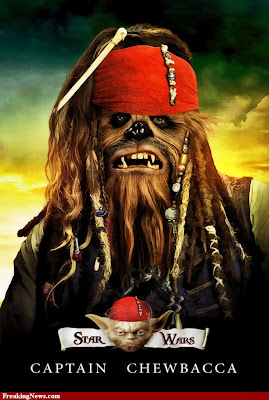 And by popular request, I now present to you another creepy Chewbacca movie poster, courtesy of FreakingNews! Any great news I missed? Does that image creep you out? See a good movie recently? Now you may visit JC Martin’s site or Flash Fiction for my short and fun interview! Special thanks to all the awesome people who left comments on Wednesday’s post. You guys rock!!! Writing careers have ups and downs. But after my UK publisher went out of business—followed by the two magazines where I had regular gigs—mine went mostly downward. I kept writing—sending endless queries into a black hole of rejection, not realizing the less-than-phenomenal sales of my UK books pretty much stamped “reject this writer” on my forehead. Figuring my fiction career was over, I started a blog to help newbies learn from my mistakes. But a few months later, Nathan Bransford accepted me as a guest poster. I’d been going through one of those dark teatimes of the writers’ soul when you wonder if you’re delusional, clueless, masochistic or all of the above. I wanted to know what keeps us writing year after year despite endless rejection. I came up with my theory about the Trafalmadorians. If you’ve read Kurt Vonnegut, you know about Tralfamadore. It’s a planet where a super-race of toilet plungers exist in all times simultaneously and control all aspects of human life. Since they have infinite time on their hands, I figured they need lots of books. And how do they get them? They compel earthlings to write novels! Millions of them. Way more than earthbound publishers and readers can handle. But on Tralfamadore—they’re consumed like Skittles. I figured the Tralfamadorians were so eager for new material, they’d worked out how to transmit stories from our brainwaves to their TralfamaKindles the minute we type “the end” on that final draft. In fact at this moment, your first novel—the one that’s been sitting in the bottom of a drawer along with 350 rejection letters and the restraining order from that editor at Tor—could be at the top of the New Tralfamadore Times bestseller list. And last month, my romantic-comedy/thriller FOOD OF LOVE debuted with Popcorn Press, and on October 6, my Mad Men-era Hollywood mystery, THE GATSBY GAME debuted with MWiDP (ebooks now; soon available in paper.) Three more comic mysteries, GHOSTWRITERS IN THE SKY, SHERWOOD, LTD and THE BEST REVENGE will debut before Christmas. None of it would have happened if it hadn’t been for those Trafalmadorians. Hey, just prove it’s not true. Anne R. Allen blogs with NYT bestselling author Ruth Harris at Anne R. Allen’s blog - updated on Sundays. Anne’s books are available on Amazon and Amazon UK, as well as Popcorn Press and Mark Williams International Digital Publishing. Questions for Anne? Questions for me? Are you totally lost? 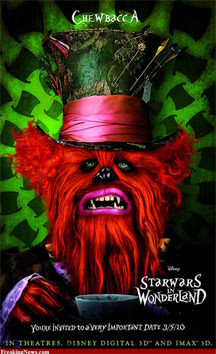 Want more scary pictures of Chewbacca? So, what’s so special about today? It marks one year since the release of my first novel, CassaStar. So, for all of you who have been such awesome supporters, and the new friends I’ve acquired since then, I wanted to share a little bit about that day and the changes since then. If I tried to thank all of those who helped me that day, this would be a really long post. (And I’d probably leave out someone.) But almost a hundred blogs posted about my release. (I hope the Catch Fire! blog party is even bigger.) Seeing my book’s cover everywhere I looked was truly humbling. I also had a blog tour during that time with nineteen stops. (Overly ambitious - I don’t recommend that many!) At some point that week, I hit four hundred followers. That day was big because I thought I was witnessing the release of the only book I’d ever write. And I was overwhelmed by the generosity and support of my blogger friends. But what has happened since that day has been incredible. The wonderful reviews from friends, fans, and readers. 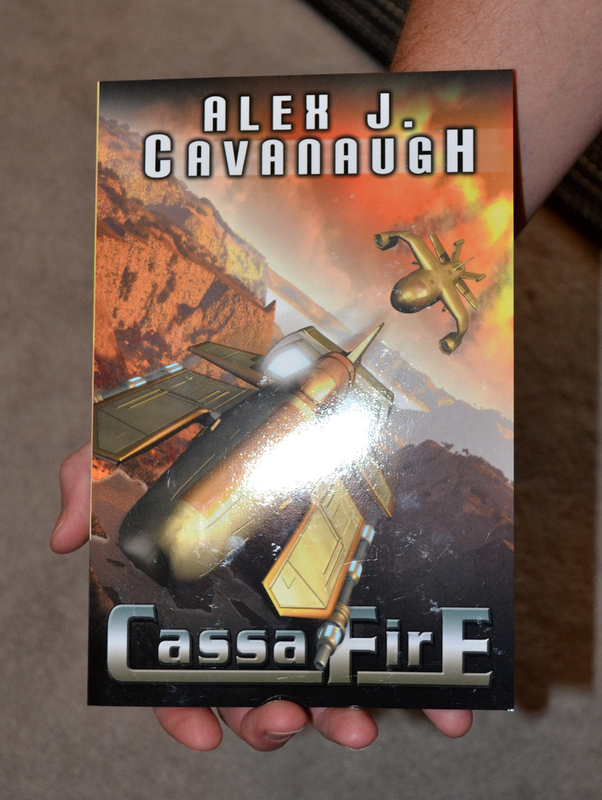 The creation of a second book I didn’t know I had in me – CassaFire. The messages from those who are buying my book even now. Hit that ever mysterious and elusive 1000 followers. The amazing amount of friends I have made, more than I ever thought possible. My increased involvement in this community through various blogfests, the A to Z Challenge, and the Insecure Writer’s Support Group. The joy of watching my friends achieve their dreams and doing what I can to support them. The journey hasn’t been without its missteps, but I hope you understand this Ninja Captain is always trying. For those about to embark on this journey or hoping to one day, remember to savor all of the moments. A year ago, I was a newbie author. Today, thanks to all of you, I’m still here, still growing, still changing, and heading for a new adventure. What motivates me now is you. All I can say is thanks! 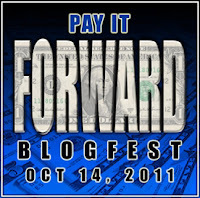 Once again, a huge thanks to everyone who participated in the Pay it Forward blogfest! There were so many comments and emails of thanks. Many of you found new blogger buddies, which was cool. The list is still posted (less those who didn’t participate and ad sites) so feel free to keep exploring. Like the Insecure Writer’s Support Group, many of you connected. Special thanks to those who visited Edi and Eve and blew their minds! I appreciate that. And a huge thanks to my co-host Matthew! 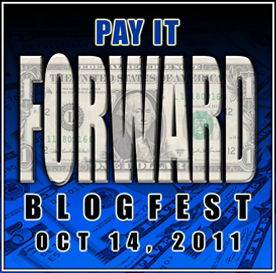 The Pay it Forward blogfest was his idea, and a damned good one at that. So, if for some odd reason you’ve never visited Matthew’s site, The QQQE, then you need to jump over there and tell him thanks. For those of you new to my blog, let me explain. Wait, there is too much – let me sum up! I am Ninja Captain Alex. Yes, I am an author. My second book comes out next February. I don’t talk much about writing here though. (You really don’t want writing tips from me anyway.) My focus is movies, music, books, games, some tech toys, blogfests, and promoting my blogger buddies. 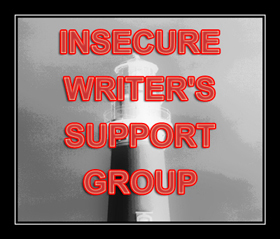 However, I do host the Insecure Writer’s Support Group, which posts the first Wednesday of every month – feel free to join us. And do not let the amount of blog followers scare you. I really try to visit and support everyone who visits me. And yes, I’m almost to a thousand followers. Be nice to hit that number by Wednesday when I have a really special post planned. Now, some congratulations are in order! Milo James Fowler at In Media Res just had a short story released by Mindflights - I Am FanFare. And I want to mention it for two reasons – it took Milo many tries to achieve success with this short story, and he deserves recognition for his accomplishments as a short story writer. It just blows my mind! So, did everyone have a good time with the blogfest? What was the coolest new blog you discovered? Any questions for the Ninja Captain? Anyone still creeped out by Chewbacca’s picture last Friday…? Hope you’ll return on Wednesday. Like I said, special day. Matthew at the QQQE and I are proud to present the Pay it Forward blogfest! I have thank everyone who commented on the book trailer for CassaFire! I am just blown awayby what my publisher created. Now to the blogfest! The purpose is to introduce others to three bloggers you find awesome. Then attack the Linky List and explore! Find some cool new friends. Take the whole weekend to discover some great bloggers. Narrowing it down to three was next to impossible. With close to a thousand followers now (yeah, that blows my mind!) I know so many cool people. So, I decided to give you a variety today. Jeffrey Beesler at World of the Scribe has been a blogger buddy of mine for well over a year. He’s now one of my critique partners as well! Jeffrey is a careful planner when it comes to his blog and will map out theme weeks a month in advance. He pours so much into his posts and everyone would benefit from his advice and proddings. If you don’t already follow Jeffrey, jump on over and visit this most excellent Ninja! Leovi is an amazing photographer! All images are abstract and close up, and it’s just amazing. Leovi is a true master. And despite the huge number of people who follow Leovi, I can always expect a comment here from this most excellent photographer. If you want to be amazed, visit Leovi today! Edi lives in Germany and runs Edi’s Book Lighthouse. I met him last year when seeking speculative fiction reviewers and we’ve been good friends ever since. He’s been a big encourager and supporter as well. His weekend posts hold so much information about books and movies it will make your head swim. He really should have a thousand followers. You want to know what’s going on in the speculative world? Visit Edi today! Eve is a new follower of mine. She seemed close to giving up the whole blogging scene when she latched on to the Pay it Forward blogfest. She needs to know what an awesome bunch of people are out there in the blogging world! Visit Eve today and tell her – I’m with you! Now, go discover some cool blogs! We Interupt This Post for an Awesome Book Trailer!!! Yes, I scrapped today's post when I got the email from my publisher Tuesday evening - the book trailer for CassaFire is live!! They are a small publisher with a limited budget, so that I have a trailer at all is just incredible. Now I have two! And not only do you hear Byron speak, but you get to see him! And Athee. And some of the key scenes from the book. All in High Definition as well! 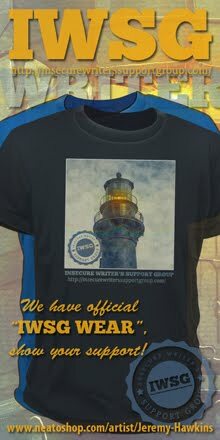 Thanks again to everyone who participated in the Insecure Writer’s Support Group and visited others this week. The list is so big, I can’t do it all by myself anymore and I appreciate your efforts to make everyone feel welcome. And thanks for your encouraging words concerning my post. Now I feel guilty for feeling guilty. On to the big news! I received word that CassaFire’s book trailer is almost done! As soon as my publisher releases it, I’ll post it here. Second, my publisher has started sending out review copies and I got mine this week. Can you believe it? My second book! Now to the big news! I am setting up a blog tour from February 27 through March 9 and I am looking for hosts. In addition to the tour, I’m throwing a party on February 28 – Catch Fire! It’s time for another group posting of the Insecure Writer’s Support Group! Time to release our fears to the world – or offer encouragement to those who are feeling neurotic. My post today may really surprise you. Here is my insecurity. It’s more of a sense of guilt. Being an author is not my dream. I envisioned one book – one good, solid story that would represent me. I wanted it to be epic, and although it fell short, I know people enjoyed it. Why should I be blessed with the opportunity to share two novels with the world? Getting published in the first place a stroke of luck. A second book was just a fluke. There are those of you out there with amazing voices who can’t get the attention of a publisher or agent. And it’s wrong. I am sorry if I am where you want to be. I really hope you reach your goal. This promises to be an awesome week! Two blogger buddies have books coming out this week. I finally came up with an entry for Rachael Harrie’s Campaign challenge. 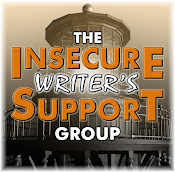 Wednesday is the next post for the Insecure Writer’s Support Group. And, I have big news about my book that will just have to wait until Friday!! Ciara Knight has a new book this week, Love’s Long Shadow. Congratulations, Ciara! She’s a very gracious, generous, and beautiful person, so visit her site and say way to go, Ciara. 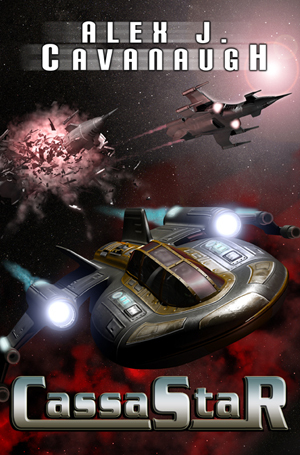 Fellow science fiction writer and astronomy master, M. Pax, has a book coming out on Tuesday - Semper Audacia. She has several short story eBooks available (all excellent, by the way) and this will be her first novel. Congratulations, Mary!!! Visit the Wistful Nebulae for more information and to congratulate her. I glanced at the TV screen. Earlier, the sportscaster had dubbed these spelling bee kids ‘twitching little freaks.’ So far, I had to agree. That’s an easy word, I thought, returning to my report. I tapped at the keyboard, determined to finish tonight. After a few minutes, I leaned away from my laptop. Reaching for a drink, my gaze returned to the TV screen. That’s the key, isn’t it? Finding the word for a sentence that mirrors our intent. Setting my drink on the coffee table, I continued with the report. I typed the final word and saved the document. Scrolling back to the first page, I read through my work. The content appeared solid and the report flowed well. However, a red line appeared under at least one word in every sentence. I ran Spellcheck, allowing the program to correct my mistakes. Many were the result of typing too fast. It was the words I’d slaughtered out of ignorance that bothered me. Where the heck did I learn to spell, anyway? Annoyed, I glanced at the screen. Any other exciting news this week? Oh, and DL Hammons at Cruising Altitude is posting the answers today to his "You Sure Do Talk Funny" challenge. Go see if you guessed which one was mine!